If you had a fender bender on your car the body shop wouldn’t sand down and repaint your whole car. We take that same approach but to the next level. We deep clean everything, repair and color match the damaged areas, then apply multiple coats of our guaranteed sealer on all the exterior cabinet surfaces. It’s a total restoration without the mess, or the usual high price of refinishing. Except for some Pickled/Whitewashed cabinets we no longer change colors on cabinetry. There are just a few craftsmen in the area that do that. Call us, we will gladly refer the best people for your special need. I’m often involved in Kitchen remodeling projects and have worked for several different contractors or directly with the homeowner. We have done several joint projects with Dakota Cabinets, for Bill’s Custom Woodworks and one with Dave’s Custom Woodworking. Together we can make your kitchen glorious. There are several levels of pricing with cabinets, refinishing, replacing or restoring. 1. Top of the price list is to get new cabinets, and I suggest everyone should dream big if you can afford it, enjoy it. There are many price and quality tiers in the local area. You may want to do your own research on that. The HBA members are my favorite as they maintain a good degree of integrity. 2. Re-facing, that is to replace all the doors and drawer faces (sometimes that’s enough and will save a lot) but usually a sheet of veneer or thin plywood is placed over the entire outside of the cabinets. This allows you to save any expensive counter tops you may have and change the wood type, color and style of your cabinets. In some cases, this process can save a lot over getting new cabinets and you certainly avoid the hassle of being without a kitchen for several weeks. 3. Color change your cabinets. Re-staining them is very challenging but they can go darker if someone has the skill and the right products. The kits you see for sale in the big box stores will turn into a disaster. Don’t even think about that. I know three guys in the area that can do amazing things to your cabinets. 4. Paint your cabinets. I’ve already addressed this in the body of common mistakes. Many pitfalls here but some paints are good for a few years. Never brush or roll your cabinets. There is a company in Nixa, MO “Kitchen Concepts” that uses an acrylic Polyurethane designed to take color and will outlast anything I’ve ever seen on cabinets. Their finish looks like paint but is way better. They actually bake their finish on doors and drawer fronts and on new cabinets. His prices are very reasonable. 5. 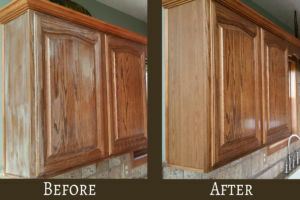 Our type of Touch-up Refinish is the most affordable Cabinet Refurbish that’s true to original that I’ve seen. It’s not uncommon that I recommend others mentioned above and have the customer come back to me to fit the project into their budget. After all, if you are already getting new floors, granite etc., countertops and new backsplash then it may be reasonable to just match those to your old cabinets and have us restore them. Specialty services we do: Touch up Painted Cabinets, Restore Pickled Cabinets, Rejuvenate Whitewashed Cabinets.